3:00 AM ETESPNcricinfo staffPakistan women 163 for 6 (Ameen 52, Taylor 2-17, Selman 2-24) beat West Indies women 159 (Taylor 52, Dottin 28, Sandhu 3-21, Baig 3-42) by four wicketsSidra Ameens half-century and three-fors from Diana Baig and Nashra Sandhu led Pakistan to a four-wicket win against West Indies in the third ODI, giving the home team a historic 2-1 series victory - their first against West Indies. 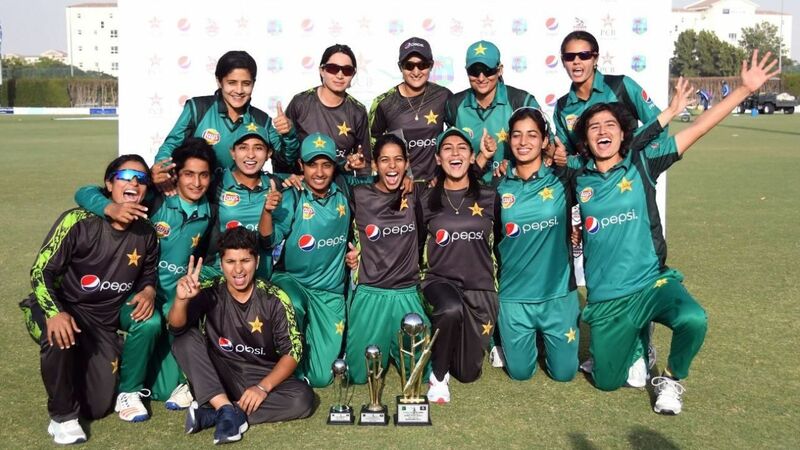 The win gave Pakistan two points, lifting them above West Indies to fourth place in the ICC Womens Championship table. Pakistan now have 12 points, the same as India, but with a much inferior net run rate. West Indies remain on 11 points. The Pakistan bowlers continued their fine show from the second ODI, in which they had bowled out West Indies for 206. This time, the visitors managed only 159. Captain Stafanie Taylor opted to bat, scored 52, and even took 2 for 17, but her all-round show wasnt enough to take West Indies through. Taylor had to walk out in the first over, Kycia Knight having been bowled by Baig off the third ball of the innings, and she stayed till the 37th over as wickets fell around her. West Indies were in a good position early on till Taylor and Deandra Dottin were batting together but Dottins aggressive 28 off 20 came to an end when she was run-out by Nida Dar in the eighth over. Shemaine Campbelle then joined Taylor for a 52-run stand as West Indies consolidated, but once Campbelle was caught behind off Sandhu, the innings stuttered. They slipped from 87 for 2 in the 20th over to 159 all out, losing their last eight wickets for only 72 runs. Only one other batsman - Afy Fletcher - reached double figures after that and she remained unbeaten on 21. The 21-year-old Sandhu built a stranglehold in the middle overs, taking 3 for 21 in ten overs. Baig returned to end Taylors 95-ball stay with a return catch, before adding one more wicket to end with 3 for 42 in eight overs. Pakistans reply was steady, with opener Ameens second straight half-century guiding the chase early on. She shared useful stands with fellow opener Nahida Khan, Javeria Khan, and Dar, before falling for 52 off 107 in the 39th over. Ameens wicket induced a mini-wobble, as Pakistan went from 128 for 3 to 139 for 6 in the space of 22 balls, but the experienced Mir came in at No. 8 and guided the team home, hitting a boundary with the scores level to seal victory in 47.2 overs. Shakera Selman took 2 for 24 in ten overs while Taylor had a fruitful seven-over stint too. But the other bowlers couldnt sustain the pressure as much to defend the sub-par total.